It is an honor to be here today to discuss the situation in Afghanistan. Today we adopt a resolution, which reaffirms this bodyâ€™s commitment to Afghanistanâ€™s peace, stability, and prosperity. I wish to take the opportunity to express my appreciation to those who contributed to the resolution, especially the German delegation headed by H.E. Ambassador Peter Wittig, for their dedication and leadership throughout the process. We extend a special thanks to Daniel Schemske for his role in facilitating the negotiations. In 2001, after the overthrow of the Taliban regime, Afghanistan was a broken state with an economy in shambles, a shattered infrastructure, and a society wearied by years of conflict. Virtually no aspect of life in our country had been untouched by war. Since then, Afghanistan has come a long way, and yet, we still have far to go. Our path to lasting peace and sustainable development has not been without its challenges. On the way forward, the supporting role of the international community will be important, and will have a considerable effect on how successful the Afghan Governmentâ€™s efforts can be. Afghanistan is approaching the end of a period, with the end of the existing framework of international military engagement and with all focus on transition to Afghan led security, governance and development. Transition in Afghanistan did not start in a vacuum. It took us 11 years to reach this point. International involvement began over a decade ago seeking to eliminate the threat posed by Al Qaeda and its regional terrorist allies to global and regional peace and security. After long years of conflict and war, a broad international coalition engaged with a commitment to see Afghanistan through on its path to peace and stability. It was not only a military effort though; the most important thing for Afghans was to rebuild the state effectively. Afghanistan started its journey a decade ago, in regaining an internal and international legitimate, peaceful role, not only in the region but also worldwide. Since 2001, significant achievements have been made from the building of schools and roads, to advancement of women to continuing economic growth and strengthening of our security forces. Today, women are playing a vital role across all sectors of Afghan society and are offered more economic opportunities, millions of Afghan boys and girls are enrolled in schools, and increasing numbers of Afghan people now have access to basic health services. Afghanistan is in a fundamentally different place from where we were in 2001, a time in which the control of provinces changed hands constantly, human rights were routinely violated, violence prevailed, and the central authority lost its relevance and power under the pressure of internal confrontations. Eleven years later, Afghanistan is looking with hope into the future, to stand on its feet and move towards normalization. In April 2014, Afghanistan will hold its third Presidential elections to choose its new leadership, and by the end of 2014 the last foreign combat forces will leave the country. With the election and the end of the military phase of international support, a new chapter in Afghanistan is unfolding; one characterized by consolidated national sovereignty, self-reliance, and stabilization of the situation. 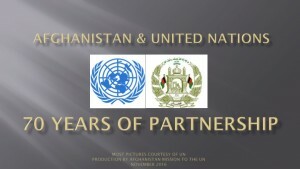 These simultaneous events represent the beginning of a sustainability decade, involving mainly a number of vital, interconnected elements in the short and long term: withdrawal of tens of thousands of combat forces; the transfer of full security responsibility to the Afghan National Army and Police; the new arrangement of the post-2014 international military engagement; the organization of free and fair elections; reconciliation aimed at ending the violence and bringing the armed opposition into the peace process, and; capacity-building for a sustainable and functioning state able to maintain peace, stability and democracy in the country for the years to come. Therefore, Mr. President, the transition framework is the only path for long-term stability in Afghanistan, putting the Afghan people in the centre of the management of security, governance and development of the country. For the success of this transition we need the strong, long-term support, and delivery of the international community. In the last two years, the transition process, was buttressed by establishing new partnerships with the international community and attempts for turning negative potential into positive through seeking new forms of cooperation in our neighborhood and greater region. Afghanistan has worked with international partners over the last two years to forge agreements on strategies to face the evolving situation in the country, and address all necessary elements of a successful transition. From Lisbon to Chicago, we worked to map out the security transition. It is about enabling Afghan forces until and after 2014, sustaining logistical and financial support, and also providing Afghanistan the necessary assistance for forces to work under the pressures of circumstances. These plans are now in motion. The security transition is on track in its third tranche during which 75% of the country will be under control of Afghan Security Forces. Afghan forces are ready to take full control as planned before the withdrawal of international forces in 2014. We see the decision at the Chicago NATO Summit concerning the shifting role of the international military to training, advising and assisting mission, as an important indication of enduring support for the Afghan people. Although there are more details that are yet to be determined, it is important for Afghanistan to have the necessary guarantee for continuing military support, as it assumes full responsibility for security in the country. The post-2014 international military engagement in Afghanistan is part of the security agreement that we have recently begun to discuss with the United States in light of our strategic partnership. Based on our national interests, we would like to see this negotiation take us to an agreement that ensures long-term peace and stability in the country. The importance of national sovereignty remains at the heart of the Afghan perspective in any talks about future engagement between Afghanistan and its international partners. A successful transition is about successful elections. The government of Afghanistan is committed to the organizing of fair, free and democratic elections that can regenerate new energies for consolidating peace and stability. We would like to see the international community continue to support the upcoming election process. We are certain that the election process will help to bring more certainty to the Afghan people about the political transition. Furthermore, the broader participation of the Afghan people â€“ inclusive of women and men from all walks of life, and with the engagement of civil society â€“Â will help the next elections become a new venue for national consensus and unity; a reflection of our shared vision for building a better future. The elections should be seen in connection with the ongoing major effort aimed at bringing stability and an end to violence, that of a search for a political solution. We have witnessed visible progress in the peace process with the Taliban and other armed opposition groups. Serious steps are being taken to prepare the ground responsibly for peace talks and a possible breakthrough in the reconciliation process. Let there be no doubt, our peace process will not continue at the expense of the hard won progress of the past decade, including human rights, in particular the rights of women. It is important to note that there is now a consensus about the necessity of an Afghan-led, Afghan-owned peaceful solution and the peace process is increasingly seen as a crosscutting issue, required for the success of transition. We are encouraged by the increasing positive thinking among a growing number of the armed opposition and support of other main actors for the peace process. The recent visit of the delegation of the High Peace Council to Islamabad, and the release of a number of Taliban prisoners by the government of Pakistan are important developments for creating an atmosphere conducive to a political solution. The efforts here at the UN have also been essential steps towards building the necessary trust and confidence in the peace and reconciliation process. We are happy to see the continuing focus of the Security Council and the greater role the Afghan Government now plays in the listing and delisting efforts of the 1988 sanctions committee. The commitment by the Security Council has been clearly displayed this week as the Chairman of the High Peace Council was asked to brief the 1988 committee and the members of the Security Council on the progress made in the reconciliation process. This is an opportunity to represent Afghanistanâ€™s intention to have a greater role with regard to the committeeâ€™s work. A successful transition will allay concerns about the possible vacuum created by the end of the military phase. In that sense, what is essential in the long-term is the economic sustainability of the Afghan state. Afghanistan assisted by its international partners is working to ensure that the Afghan state can function effectively, moving from a primarily aid economy, to a self-sustaining one during the transition and transformation period. The Tokyo Conference in July has made significant steps toward addressing this issue by a clear expression of long-term financial commitment and presenting a shared vision in the mutual accountability framework that addresses the need of our Government for core funding and the need of our development partners to know that the money will be spent well. 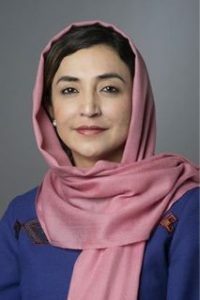 In Tokyo the international community committed to continued engagement in Afghanistan, while the Afghan Government committed to being financially responsible and focusing on good governance. Ending corruption and ensuring a transparent and efficient administration which enjoys the full trust of the Afghan people remains a high priority. In this regard, the Afghan Government has redoubled its commitment to rule of law and good governance. H.E. President Karzaiâ€™s decree of 21 July presents a comprehensive approach instructing all Ministries, agencies and independent departments to implement measures and reforms to eliminate corruption and improve transparency. Global engagement in the last decade has brought an unprecedented level of regional and international interaction in Afghanistan. Afghanistan has become a meeting place of dozens of global and regional powers and organizations. The international community has been linked to the stabilization and reconstruction efforts in the country, a fact that is reflected in the level of troop contributions, financial support, and institution building. As we complete the transition, the current form of involvement will be replaced by a multitude of bilateral and multilateral cooperation between the Afghan state and its global and regional partners. On this basis we have begun developing various mechanisms for how to bring the greater region together for political economic, and security cooperation. At the center of this effort is the Istanbul Process. Over the course of this year we have seen the Istanbul Process gain noteworthy momentum in its efforts to unite the Heart of Asia countries towards the shared goal of peace and prosperity in Afghanistan, its region, and beyond. The Istanbul Process is turning into a central forum for regional cooperation that will enhance and bring coherence to regional initiatives through the confidence-building measures and various mechanisms for cooperation to which we committed. With effective regional cooperation, Afghanistan is reclaiming its historic role in the region, with the potential to serve as a trade and transport hub as well as a catalyst for broader collaboration. Afghanistanâ€™s future is about sustainability. It is about consolidating our successes and not losing what we have worked to achieve over the past decade. For the remainder of transition, we must not fall behind in our efforts, for even a moment. The next two years are vital for the country. The Government of Afghanistan is committed to working each day to help the Afghan people by developing infrastructure, protecting human rights, enhancing good governance, and improving delivery of services as outlined in the resolution we pass here today. However, Mr. President, the continuation of a violent campaign by the enemies of peace, stability and prosperity remains the greatest challenge to Afghanistanâ€™s progress. The irresponsible, vicious attacks against innocent Afghans, by the Taliban and other extremist armed groups, are aiming to undermine our hard-earned achievements. But the Afghan people will not be deterred from their struggle to bring peace and security in the country and eliminate sources of destabilization. It is important that this struggle is supported by all who want to see an end to terrorism and extremism. That is why close cooperation in the region including with Pakistan, is essential. As H.E. President Karzai emphasized in his letter to Pakistani leaders on 13 October, there is need for both countries take a coordinated, collaborative, and serious action with strong determination against terrorism and extremism. The last decade in Afghanistan has seen historical strides. There are some who talk about a coming disaster as the international forces leave. We do not subscribe to such negative interpretations, but of course, the future of Afghanistan hangs on many â€œifs.â€ We are realistic in recognizing the variables in the coming years, but it is our responsibility, together with the international community to reduce uncertainties. We do not see transition as a cliff that could be fallen from with just one false step. The transition is more than an idea; it is a concrete concept, with real resources and deliberate plans; plans that can shape realities. Afghanistan looks forward to working with the international community in the coming years to achieve the noble objective of bringing a lasting peace, stability and prosperity to the country.